RLI's personal umbrella insurance is a good source of protection for your customers. Our program is available through independent insurance agents and selected program administrators in all 50 states and the District of Columbia. If you are interested in selling RLI's Personal Umbrella Policy, ask your program administrator for access to PUP Access, our online quote, issuance and inquiry system. RLI offers free customizable RLI personal umbrella insurance marketing materials for agents. These materials are provided in pdf format and may be customized with agency contact information. To customize: click anywhere in the customizable box and enter your information. Contains overview and benefits of RLI's Personal Umbrella coverage.Provided 3-up on 8.5" x 11" two sides. Imprint area on back. 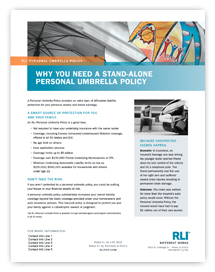 Contains overview and benefits of RLI's Personal Umbrella coverage. Full size: 8.5" x 11" one side. 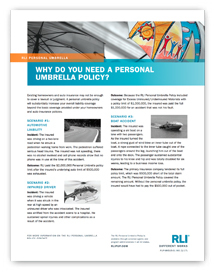 Real-life claim scenarios demonstrate the benefits of an RLI personal umbrella policy to your customers. Full size: 8.5" x 11" one side. 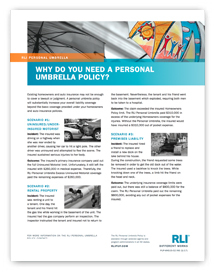 Additional real-life claim scenarios demonstrate the benefits of an RLI personal umbrella policy to your customers. Full size: 8.5" x 11" one side. Connect with our team for a program administrator referral. Use our online quote tool to get a preliminary quote. See if your customers qualify with our self-underwriting applications.